Is plastic recycling better or its reuse? The question has been debated for long now; some feel that especially plastic PET bottles can be reused for sometime before discarding, whereas others feel its recycling is better for the environment. I wonder if artists who create a plethora of designs from these bottles ever consider the point. Over time we have come across plastic bottle funnels, pencil cups, vases, drawer organizers, etc. that have been craftfully designed using plastic bottle and today we are here to tell you about a car canopy designed by Garth Britzman of Lincoln, Nebraska. Discarded plastic bottles have been deftly used to create this colourfully beautiful canopy. 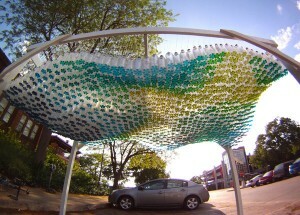 Garth has used approximately 1500 old plastic bottles to create the parking canopy in her home town Nebraska. The installation has been named as Pop culture because it stimulates creativity through alternate use of plastic bottles. Fulbright Canada and University College of Architecture were so impressed with the concept that they agreed to fund it. Also students from the University of Nebraska volunteered to spend 200 hours working on the project to support the artists endeavour to promote plastic reuse. Aesthetically the canopy looks like a blanket of different colored daisies. The base of the bottles has been filled with colored water in shades of blue, yellow and green, something I bet you’ve never seen. It is supported on a regular carport frame which can be easily bought from a DIY center.